Versatile with uses in a variety of situations, but particularly great for the outdoors. Highly portable, but great for being permanently placed also. Modern design, comfortable and purpose built for adults. Excellent sized tanks meaning refilling and emptying is not constantly required. 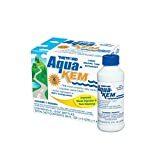 It's fully sealed so you are never going to have to worry about splashback or odors. Piston flush which is both quiet and powerful. Depending on how high you want to be, this unit is about two inches shorter in height and length than the Thetford 550E. Priced just under the Thetford 550E, this unit is priced a little on the high side. This is an excellent toilet that operates very similarly to the Thetford 550E Curve, but with a few less whizz bang features. 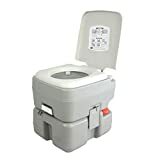 However, it is still a step above many others with a piston flush and excellent sizing to make all adults comfortable using this portable toilet. It's highly portable and easy to use, making it an ideal unit for many different situations. Highly portable and easy to carry. Piston flush – powerful and simple to use. Detachable lid and seat make it very easy to clean. Easy to view waste tank level indicator. Modern design reflecting a domestic toilet with an ergonomically designed seat for extra comfort. It’s all fully self-contained so there is no danger of it leaking or splashing. It’s very easy to use and easy to clean like all Thetford toilets. A sliding valve operates between the waste tank, keeping odors contained and preventing splash. There is an optional hold down kit which assists in securing the camping toilet to the ground, or to keep it in places whilst in transit. Both the upper and lower units have handles designed for easy separation and carrying. The unit has a rotating waste spout means that the actual distance between you and where the waste empties from is increased, therefore reducing the opportunity for splashing. Its portability means it can be used in a variety of different situations, not just camping. Has a toilet seat that latches in place. Tank capacity: Waste tank – 5.5 gallons and fresh water tank 4.2 gallons. The Thetford 92853 Porta Potti 550P continues the strong branding and design of the Porta Potti range. The toilet is high enough to make it feel as though you are using a domestic toilet. The seat is comfortable, sturdy and holds adults well. 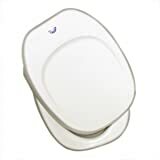 A good sized bowl is also a common quality amongst the Thetford brand of portable toilet. Larger adults have attested to the robustness and size of the unit which allows them to sit comfortably on the toilet. The piston flush makes flushing a breeze, with a light pump providing a powerful flush. A pull out lever operates the sliding valve that covers the hole at the bottom of the bowl. When the toilet is not in use, and when being emptied, the valve should be closed. Open the valve when using the toilet. This valve also ensures odors are kept in the waste tank and prevents spillage when driving. 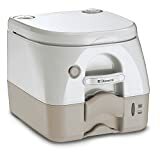 This toilet is incredibly easy to keep clean, and the detachable lids expedite the cleaning process, ensuring that all surfaces can be cleaned properly. 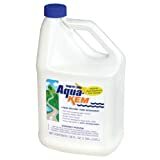 The fresh water tank has a 4.2-gallon capacity, which is excellent as it requires less refilling on a constant basis. It comes with a strong handle to make it easy to carry. The waste tank holds 5.5 gallons and comes with a strong handle to hold the waste tank when emptying. The waste spout rotates and extends out off the waste tank, making it easy to pour out the waste and increasing the distance between you and the spout. The spout has a solid screw cap and a good size opening to allow for immediate cleaning after the tank is emptied. 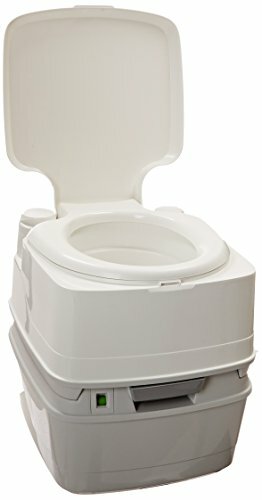 No batteries are required for this toilet. Spare parts are available directly from Thetford. 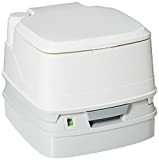 Thetford has a one year warranty for portable toilets that are used for personal use. 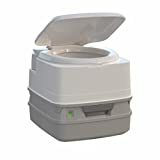 As the warranty does not cover damage you might do to the portable toilet, it is recommended to use the Thetford cleaning products. Never use rough cleaners, pastes, scourers or acids on any of the toilet or toilet parts, especially the valves and seals. Using the recommended products also helps to keep all parts properly maintained. For further information refer to the full disclosure.